There are many easiest ways to import your data from any csv or text file into your database table. 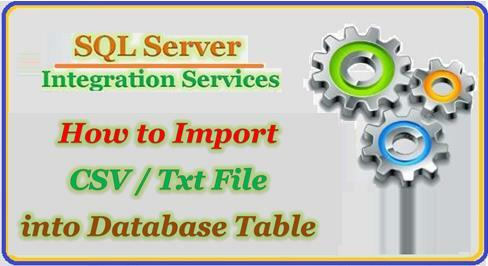 If there is a csv or text file which is coming from any other source/server to your server and you need to import this file on daily basis at the scheduled time automatically, and update the changes if changes are in the file. To meet your business requirements, SQL Server Integration Services (SSIS) comes into the picture to import flat files on a scheduled basis. There are very simple steps to create a package in SSIS and import the data from any csv or text file into your database table. Unfortunately, SSIS requires static metadata, what I say is it will remember what you set in the Excel Connection Manager or Flat File Connection Manager, so if tomorrow the number of columns is not the same anymore then the package will break at the validation phase.